The Talairach Applet provides a web application for the Talairach Daemon. Since it is an applet, it requires Java to run. 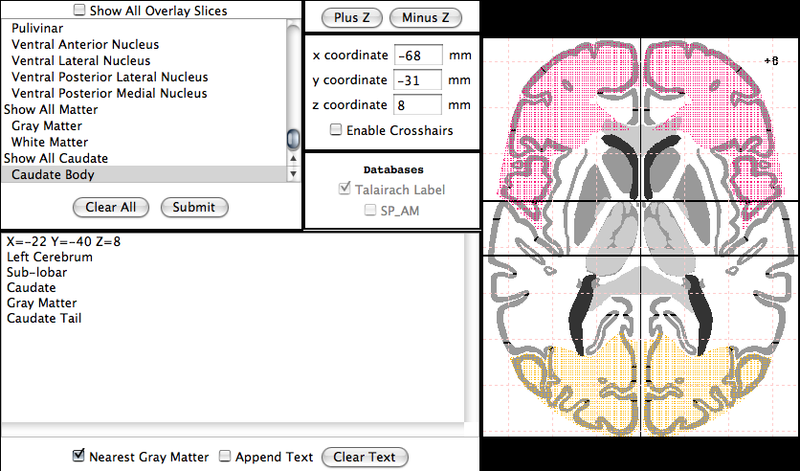 In addition to providing label data and structural probability maps, the applet also displays graphical overlays of each region and can find nearest gray matter. Launch the applet in a new window. Having trouble running the applet? We have some help on getting it to run in your browser. Update the Java Runtime Environment (JRE) at Sun's official site.